A special issue of an interdisciplinary journal looks at the rising tensions between Muslims and Christians in the wake of the Arab revolts but, alas, provides few new insights. 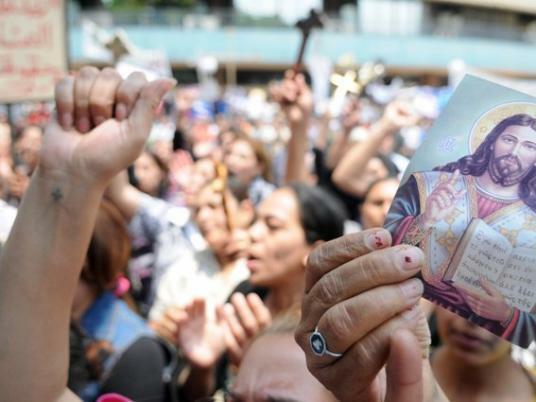 Muslim-Christian tensions are again volatile in Egypt, following the revelation that the inflammatory anti-Muhammad video was created by a diasporic Copt. Christians accused of criticizing Islam are sitting in jail, their trials fast-tracked, while Salafis who shred the Bible on video walk around free on bail, their trial dates uncertain. At this timely juncture comes a special issue of the journal Islam and Christian–Muslim Relations focused on the challenges posed to Christian-Muslim relations in the wake of the Arab revolts. Unfortunately, the issue is diffuse and spotty in the focus and quality of the articles, and has only limited relevance in helping us think about what’s going on in the region right now. Greg Barton’s opening “reflections” are more reflections on the special issue itself than on the challenges; he leaves the articles to speak to those. And they do, but sometimes only tangentially, addressing the core issue but addressing the revolutionary impetus only in passing, or to set up a more general paper. My favorite article is by Francesca Comunello and Giuseppe Anzera, “Will the revolution be tweeted? A conceptual framework for understanding the social media and the Arab Spring.” In its effort to find a middle ground between cyberutopianists and cyberpessimists (whom they call “digital evangelists” and “techno-realists”) it breaks no new ground. It does, however, have a nice summing up of ten lessons that can be culled from reviewing the literature so far on the use of social media in the Arab revolts (especially in Tunisia and Egypt). The editors and publishers must have liked this article too as they have made it freely available on the web here. the aim of this article is to explain from a qur’anic point of view what should characterize Muslim relations and attitudes towards non-Muslims in day-to-day life and the rules that should be applied to non-Muslims. It concentrates on a selection of key qur’anic verses relating to the subject and attempts to demonstrate that Islam as prescribed in the Qur’ān and exemplified by the life of the Prophet Mu ammad and his Companions accepts, celebrates and even encourages diversity, harmony and peaceful co-existence with non-Muslims. His account of the meaning of Qur’anic passages that support harmony among the people of the book should be useful for teaching and instruction, and the publishers have made it freely available on the web at least for now. The term ‘People of the Book’ is utilized in the text of the Qur’an to refer to both Jews and Christians. The Qur’an employs some positive expressions regarding the People of the Book in various places, but it also sometimes seems to have a negative view of them in some respects. Q 5.51 (on taking Jews and Christians as allies) is one such negative reference. The prime concern of this article is to shed light on Q 5.51 with special reference to its historical context, and to illustrate how it has been interpreted by some exegetes from the classical and modern periods. It provides some key points for the understanding of this verse and similar verses in the light of the historical background, the context of the overall qur’anic message, and linguistic analysis with reference to some classical and modern exegetes. The Arab spring started the transformation of long-lasting regimes in the MENA region into democracies from the bottom up, as a series of grassroots, leaderless movements, with the people’s cry for change facilitated by, among other things, new communication technologies. But overall, the so-called Arab revolutions would have been impossible without the help of the military. The military was the cornerstone of the former authoritarian regimes, but when it allowed the change, part of these ‘revolutions’ became top-down managed by military elites. This article postulates that these social uprisings were not true revolutions, but rather calls for a transition or transformation of the existing regimes into different institutional patterns. Toppling the regimes and having the first free elections is not enough to consolidate these young democracies. This article argues that there are four criteria for the consolidation of democracy: 1) constitutional consolidation – constitutional institutions need to be consolidated; 2) consolidation of representatives – political parties and interest groups need to be consolidated; 3) consolidation of behavior – will the veto-actors defy and challenge the new democracy? ; 4) consolidation of democratic political culture – will the values of the people challenge the values of a democratic regime – and if so, will the values of Islam challenge democracy? At the centenary of the Ottoman (Turkish) withdrawal from the Middle East, Turkey is passing through a period when great things are again expected of it as a role model for the transformation process in the Middle East. It is clear from the statements of politicians, as well as the media, that Turkey has eagerly embraced this role, responding to expectations widely reported in both the international and national media that Turkey’s success holds lessons for the broader region. There is no doubt that this view allows us to make assessments about the likely trajectory of the ‘Arab Spring’, the expression coined by international Western media. In the present article, some of the historical social conditions and institutions that have played key roles in Turkey’s consolidation of democracy will be explored as a way of helping us better understand the recent developments in the Middle East and North Africa. Not at all useful in thinking about the Arab revolts, but very interesting in its own way, is an article by Ilan Shdema that uses interviews, surveys and documents like letters and diaries to examine changing relations between Christians and Muslims in Israel between 1967 and 2010. It relation to the Arab revolts is entirely artificial–there’s a little reference to ways the Arab revolts enter into peoples discourses–but his chronological account of the ways the two populations drew apart, and how tensions , sometimes escalating into violence, arose between them, is worth reading in its own right. He links the rising tensions primarily to socioeconomic especially, privatization and commercialization, which increased economic competition between the two communities. Ben Rich, a scholar at Monash University’s Global Terrorism Research Centre in Melbourne, has what is clearly the most useless article in the bunch. Rich’s article posits that the whole Arab revolution is just a distraction from the real issue, which is “the increasing likelihood of a conventional war arising between Iran and an Arab coalition in the Persian Gulf.” One doesn’t know whether to laugh or cry. There are so many specific, concrete and empirical ways the important issues of Muslim-Christian relations could be approached in the wake of the revolution, but this special issue is a disappointment. Abu-Munshar, Maher Y. 2012. In the shadow of the ‘Arab Spring’: the fate of non-Muslims under Islamist rule. Islam and Christian–Muslim Relations 23(4): 487-503. Barton, Greg. 2012. Reflections on the ‘Arab Spring’: introduction. Islam and Christian–Muslim Relations 23(4): 415-416. Comunello, Francesca and Giuseppe Anzera. 2012. Will the revolution be tweeted? A conceptual framework for understanding the social media and the Arab Spring Islam and Christian–Muslim Relations 23(4): 453-470. Çoruh, Hakan. 2012. Friendship between Muslims and the People of the Book in the Qur’an with special reference to Q 5.51. Islam and Christian–Muslim Relations 23(4): 505-513. Erdem, Burcu Kaya. 2012. Adjustment of the secular Islamist role model (Turkey) to the ‘Arab Spring’: the relationship between the Arab uprisings and Turkey in the Turkish and world press. Islam and Christian–Muslim Relations 23(4): 435-452. Rich, Ben. 2012. “Gulf War 4.0: Iran, Saudi Arabia and the complexification of the Persian Gulf equation” Islam and Christian–Muslim Relations 23(4): 471-486. Zgurić, Borna. 2012. Challenges for democracy in countries affected by the ‘Arab Spring’ Islam and Christian–Muslim Relations 23(4): 417-434.